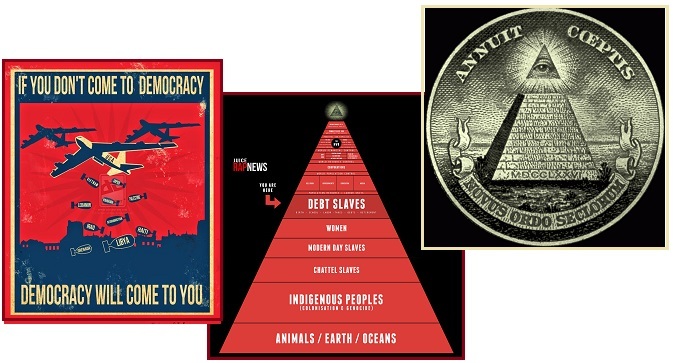 What is the New World Order? This is a concept, and term introduced by western politicians after World War I and World War II and used extensively by George Herbert Bush. The concept embraced the formation of the UN and NATO, and the International Monetary Fund and World Bank. Like many well intentioned campaigns, it was taken over by those who were anything but benign. Debt slavery is a key part of the grip of control. Starting wars to increase territorial control is another. It is evil cloaked as a helping hand. 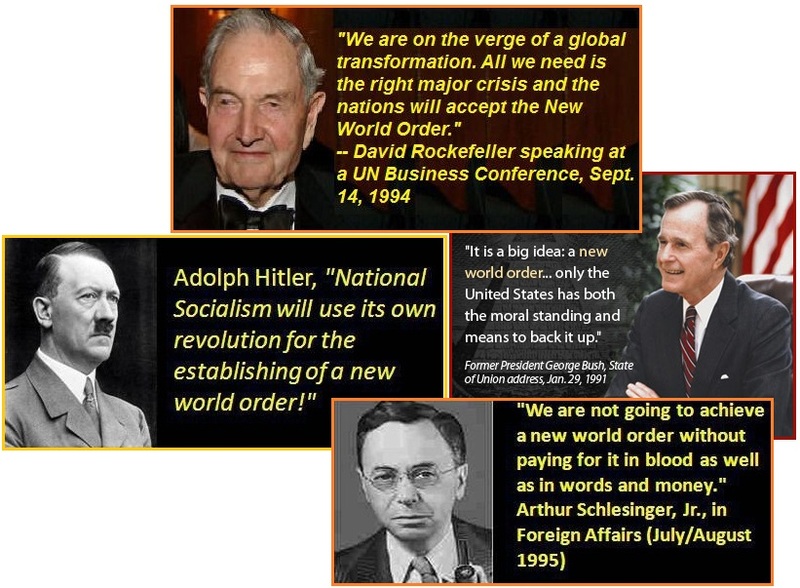 During the 20th century many politicians, such as Woodrow Wilson and Winston Churchill, used the term "new world order" to refer to a new period of history characterized by a dramatic change in world political thought and in the balance of power after World War I and World War II. They all saw the period as an opportunity to implement idealistic proposals for global governance in the sense of new collective efforts to address worldwide problems that go beyond the capacity of individual nation-states to solve, while always respecting the right of nations to self-determination. These proposals led to the formation of international organizations (such as the UN in 1945 and NATO in 1949). In his speech, Toward a New World Order, delivered on September 11, 1990 during a joint session of the US Congress, President George H. W. Bush described his objectives: Now, we can see a new world coming into view. A world in which there is the very real prospect of a new world order. ZetaTalk Comment 1995: Essentially, anything that spreads the truth and educates people, allowing them to make their own decisions, is not what the elites desire. Therefore, vehicles like books, telephone connections, open correspondences, and most certainly the Internet give people information freedom, not what the elites desire, but matters like book burning, communications strictures, and censorship show the heavy hand of the elites. Independence is another worry of the elites. Where people can grow and market their own crops, set their own prices, and travel about they are given freedom from repression, not what the elites desire, but where they fear to move else they starve, and are not given travel permits anyway, this shows the heavy hand of the elites. Those attempting to establish the New World Order seek to keep man ignorant, but most importantly they seek to keep man nervous and despairing. There is currently a domino effect following the loss of the 2016 election by Hillary Clinton. The Bush/Clinton crime family put $1.2 billion into securing the White House, and lost to Trump who hardly spent a dime. Europe is tumbling, and the falling bodies can even be heard in New Zealand. Citizens everywhere are tired of being told they need top down control – the UN, the European Union, NATO – while they suffer under trade deals that benefit corporations and the wealthy. Throw the bums out! 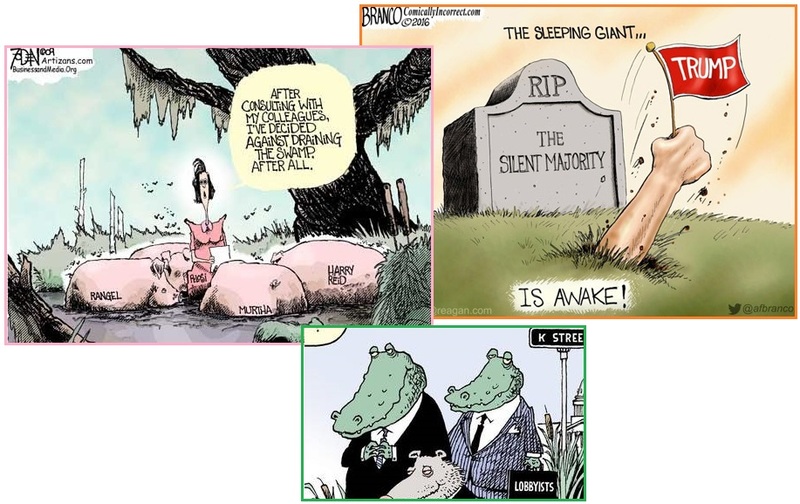 Drain the swamp! This is the new cry from what is called the progressives movement. Given the strength of the well-funded Bush/Clinton crime family, how did this revolution occur? The Zetas explain. Opposition parties denounced the proposed amendments to the 68-year-old constitution as dangerous for democracy because they would have removed important checks and balances on executive power. Under the proposals, the second-chamber Senate, currently a body of 315 directly-elected and five lifetime lawmakers, would have been reduced to only 100 members, mostly nominated by the regions. The chamber would also have been stripped of most of its powers to block and revise legislation, and to unseat governments. French conservatives have picked Francois Fillon as their presidential candidate in next year's election. Fillon could face far-right National Front Party leader Marine Le Pen in the final round of the presidential vote next spring, as voters are widely expected to boot out the Socialist Party that has ruled France since 2012 under the leadership of President Francois Hollande, whose popularity is waning. ZetaTalk Insight 12/10/2016: The US elections have gotten special attention from the Transformation Team, a group closely coordinating with the Council of Worlds and benign aliens worldwide, because of the immense impact the US Military has around the world. The US has a military as large, or larger, than all other countries combined. This has been used in the past to push corporate agendas, and to place Israel and Jewish bankers in control as well as to grant power to the Bush/Clinton criminal network, including their associate Soros. The agendas of this cabal have ruled, for decades, but is in the process of being taken down, one loss after another. The Transformation Team, as we have explained, is composed of many parts. 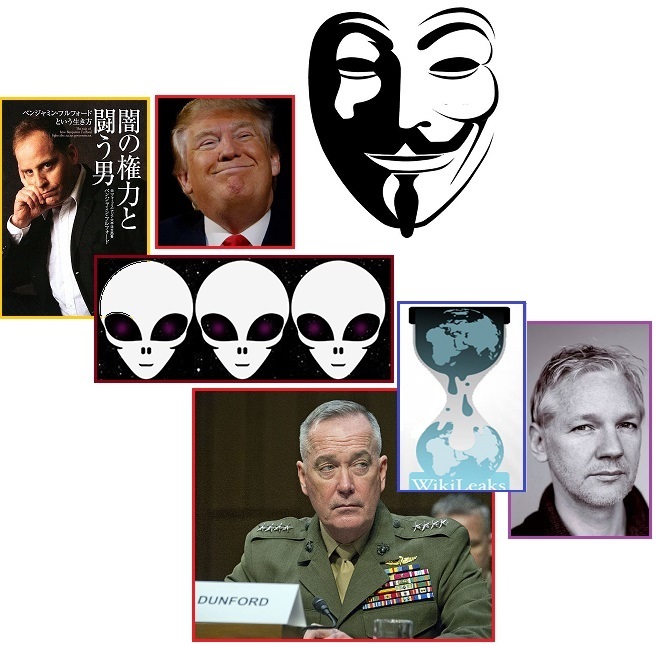 Ben Fulford and his groups, Wikileaks and Assange, Anonymous working with millions of contactees behind the scenes, General Dunford who is currently in charge in the US, the Puppet Master who wishes to see the populace of the world informed about Nibiru and the pending passage, and his protégé Trump, ourselves at ZetaTalk and Nancy, and many, many others who quietly work behind the scenes. This Transformation Team owes their strength to the backing of the Council of Worlds, who went to war with the elite of Earth over their objection to the Nibiru announcement. The cabal being taken down, whom Fulford calls the Khazarian mafia, wanted war with Russia, essentially World War III, and to create chaos forcing Martial Law in the US and Europe. This has been stopped by Trump’s election. What is being stopped are the Soros riots such as Black Lives Matter and anti-Trump, and in Europe the continuous flood of ISIS embedded refugees that would have eventually created so much chaos in Europe that Martial Law would have been called. The cabal wanted what they called the New World Order, top down elite control. This included existing elites such as European royalty and political parties that have ruled for decades. The attacks on the cabal have included what we will call the Gold wars, constantly in the Fulford reports. This stems from the theft of Gold from Fort Knox (which occurred under Clinton and Bush) and other victims, pedophilia exposure, and the takedown of money laundering networks such as was done by the Panama Papers and the coming investigations into the Clinton Foundation. There is a natural domino effect from the slipping grip of the cabal. The success of the Trump campaign shows this, a reaction against what is called Globalism whereby the top down control benefits from trade deals while the common man suffers. Immigration to create chaos, long a Soros tool, will be blocked while war mongers such as ISIS and Turkey and Israel are halted. This domino effect also includes election results in Europe. Art Bell of Coast-to-Coast used to say, when things heated up, that it was “the Quickening”. Very apt phrase for the uptick in Earth changes being experienced. The Quickening wobble shows up on weather maps. The Jet Stream is crossing over the N Pole and blowing Siberian air down over the N American continent. Yes, this is due to the Polar Push, where the magnetic N Pole of Nibiru gives the magnetic N Pole of Earth a shove, once a day, when it comes over the horizon to face Nibiru. This is when the Pacific is facing the Sun. This shove to the North has been noted by observers in Southern Australia, as well as on Jet Stream and air pressure and temperature charts. 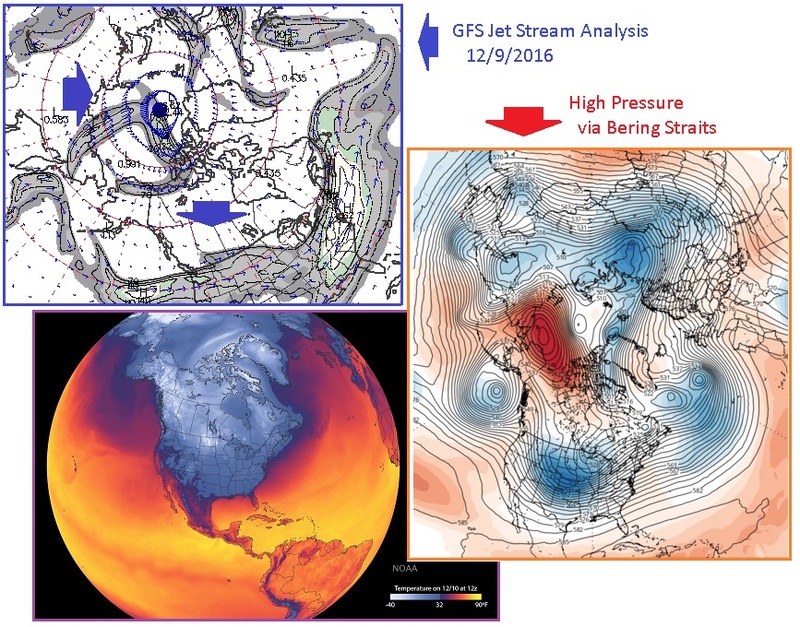 The air pressure charts show that the Polar Push creates a high pressure bubble in the Bering Straits between Alaska and Russia, which then forces cold air from Siberia down over N America. This is new, recent, and is entirely due to the daily Earth wobble. Everyone to whom I have talked recently here in Adelaide (in South Australia), and who pays attention to the physical universe around them, agrees that the Sun is rising further south and setting further south than before. They acknowledge that they cannot prove it, as they had not in previous years marked-out rising/setting lines on a circle, sun-dial style, but they are clear that the Sun is shining into spots in their homes/offices where it has not previously shone. 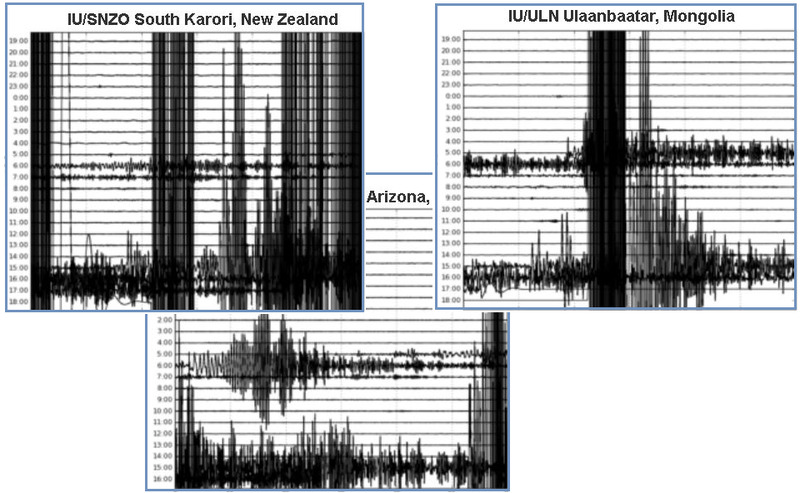 The Quickening can also be seen in the increase in intensity and frequency of earthquakes. Just this past week on December 8 there was what was likely a magnitude 8+ along the San Andreas Fault Line in the ocean off-shore from Northern California, and just over two hours later, another, even larger, in the Solomon Islands. 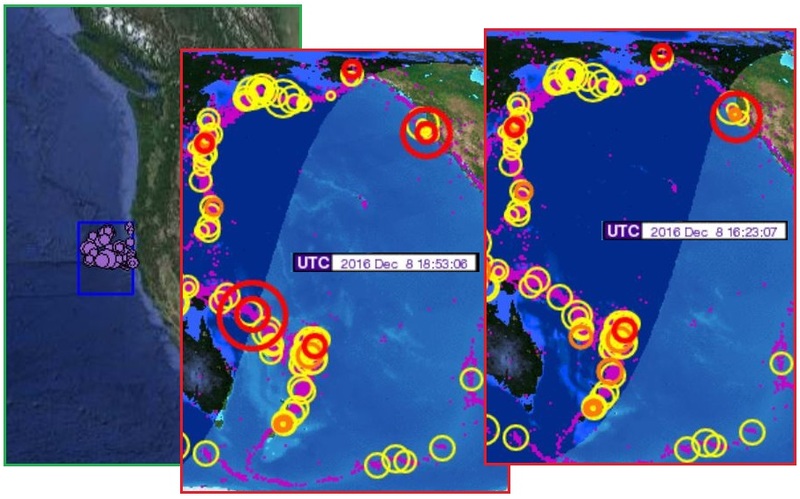 Both these quakes and the aftershocks in these locations caused the Earth’s seismographs to “ring like a bell”, all participating, even though these seismographs had been tuned down over a decade ago to help conceal the earthquake increase from the public. We have taken a giant step up now, clearly the Quickening. Of course, the wealthy are in the know about the pending passage. While the common man has been kept in the dark, so they faithfully plod to their jobs and pay their bills, the wealthy have been in the know and have been preparing. This preparation has lately reached a frantic pace. This newsletter has covered bunkers for the rich in Issue 354 in 2013 and in Issue 268 in 2011, but the pace has clearly picked up of late. There are serious problems with these elite plans, which the Zetas have often addressed. Do they know something that the rest of us do not? The elite are feverishly constructing luxury bunkers at a pace unlike anything we have ever seen before. Affluent European elites are turning to bodyguards in response to a rash of high-profile street crimes and terrorist attacks. The rich are also in the vanguard of a new wave of interest in survival shelters and underground bunkers, with ever more elaborate and fortified enclosures being constructed. Wealthy people around the globe are quietly moving away from major cities because of fears of social instability. Increasing crime, terrorism and rising racial tensions have all been identified as factors driving the exodus. This is all very odd, because among the general population interest in “prepping” has hit a multi-year low. In fact, sales of emergency food and supplies are way down at the moment across the entire industry. So once again the question must be asked – do the elite know something that the rest of us do not? ZetaTalk Prediction 6/8/2002: As we have predicted, they will move increasingly to circle the wagons, going into their enclaves, guarded by the military or militia. Wealthy neighborhoods now have such guards and restrictions, and this will become the mode, all around. No comment. Secret meetings. Agreement not on paper. Explained as the need to protect during terrorism, or the need to protect politicians from assassins. ZetaTalk Prediction 7/9/2011: Might the mob be at their door? The elite fear that stability anywhere might not be possible, even in a well guarded bunker. They see air travel increasingly risky, and are aware of our warnings about electronic failures. Just when does one dash for the bunkers, without giving the location away? In many cases, they are trying to get a foot hold in several sites, in case one becomes devastated by a natural disaster or is overrun by hungry and desperate mobs. They may have several at a distance, likewise, in case the political climate changes, or air travel becomes impossible, or giant whirlpools develop in the oceans making travel by boat risky. We have stated that their enclaves will be fraught with pecking order battles, their guards taking over with much brutality. For all their options, they are likely to find, in the end, that they have not chosen well, ending up no better off than the least among you. Location is often a problem with elite bunkers. The elite have heard that the passage is approaching, but fail to take ZetaTalk seriously. 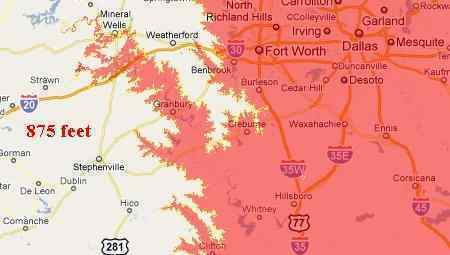 Their chosen locations can be in the flood zone, such as the new Trident complex northeast of Dallas. Per the Zetas, this will be awash from sloshing from the Gulf of Mexico during the hour of the Pole Shift. Is the Trident complex water proof? Perhaps this is why their insignia is a trident. An investor group is planning for a doomsday scenario by building a $300 million luxury community replete with underground homes. There will also be air-lock blast doors designed for people worried about a dirty bomb or other disaster and off-grid energy and water production. The development, called Trident Lakes, is northeast of Dallas. 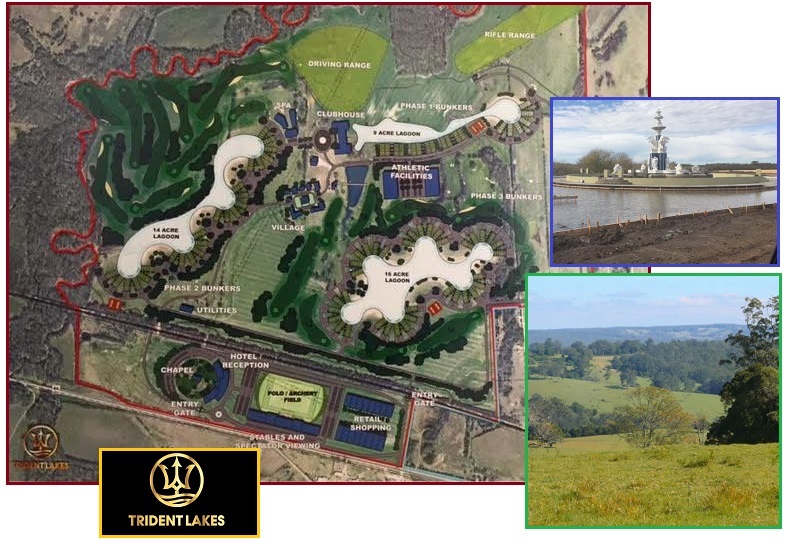 Residents will enjoy an equestrian center, 18-hole golf course, polo fields, zip lines and gun ranges. 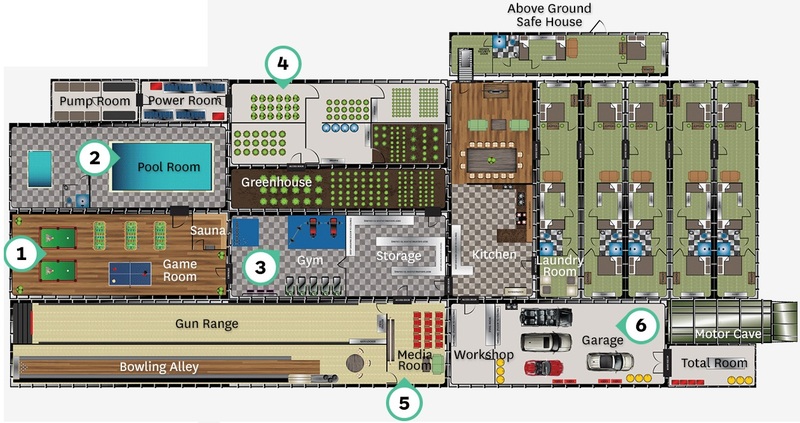 Retail shops, restaurants and a row of helipads are also in the works. ZetaTalk Warning 2001: Dallas, Forth Worth, Austin and San Antonio are all along the edge of the Balcones Escarpment edge where they will not have the height to avoid the pole shift sloshing, which for Texas will be as high as 875 feet. Scoured clean by the tide, with floatsam dragged out to sea, there will be few survivors. Residents of these cities, hoping to survive the pole shift, should move inland sufficiently so as to avoid the pole shift tides and not expect to be able to return to their devastated homes afterwards. The main problem with elite bunkers is food production. What will they eat when their stored food runs out and paper money is worthless? We have addressed this for the common man in Newsletter features such as Survival Tips in Issue 364, Survival Steps in Issue 107, Pole Shift survival tips in Issue 187, Kudzu Self Reliance in Issue 303, Self Sustaining Homesteads in Issue 131, Tidal Basin Houses in Issue498, Houseboat Living in Issue 437, and Bugs as Food in Issue 370. But elite bunkers have inadequate space assigned to food production, almost as though the only thought was for a bit of lettuce for a salad garnish until they can emerge and take over the world again. 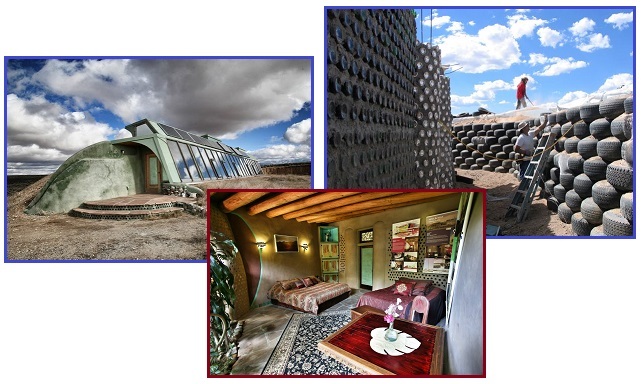 Earthship bunkers are mobile and can be built anywhere, but where is the self-sufficiency mainstay - food production? The bizarre U-shaped hideaways, which can reportedly survive in any climate, can be deployed to any part of the world and are self-sufficient enough to survive in isolation – during killer virus outbreak or a radiation catastrophe. Oscar winners, sports stars and Bill Gates are building lavish bunkers. Those who can afford to pull out all the stops for so-called self-preservation are doing so — in a fashion that goes way beyond the submerged corrugated metal units adopted by reality show “preppers” — to prepare for anything from nuclear bombings to drastic climate-change events. Sales at the most upscale end of the market — mainly to actors, pro athletes and politicians (who require signed NDAs) — have increased 700 percent this year compared with 2015. Yet another problem with elite bunkers is shifting ground, which will happen during the hour of the Pole Shift. Entry ways will be trapped, the bunkers filling with ground water, and become an unimaginable horror for those unable to escape. ZetaTalk Prediction 2/23/2002: Given the size of the quakes, Richter 9 force worldwide, with mountain building and renting of continental rifts, these underground facilities will hardly be a safe place. It takes little to trap an outlet, torque an elevator such that it cannot rise or fall, and create panic in the tomb. Air circulation will not work, slowly smothering those trapped inside. Water will find its way into underground pockets, drowning those trapped. Electrical equipment will falter, plunging those into darkness.